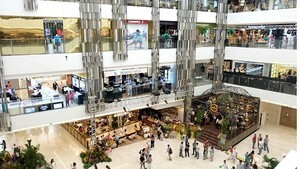 Ha Noi’s shops, hotels and restaurants are busy preparing for Christmas and eager families are out shopping for presents, decorations and the many services that spring up for the festive season. "Santa Claus is coming to town" (Photo:KK). Since the beginning of November, the stores along Luong Van Can Street have been stocking up on decorations and fitting themselves out to suit the season. Ms. Le Hang from Le Hiep’s shop says Christmas shopping has started earlier than usual this year and notes that there’s more seasonal merchandise than ever. In previous years most Christmas decorations were bought by retailers, hoteliers and restaurateurs but these days ever more people seem to want to decorate their homes for Noel. What’s noticeable about this Christmas is the preference for Vietnamese rather than Chinese decorations thanks to the lower prices and more pleasing look of the local stuff. 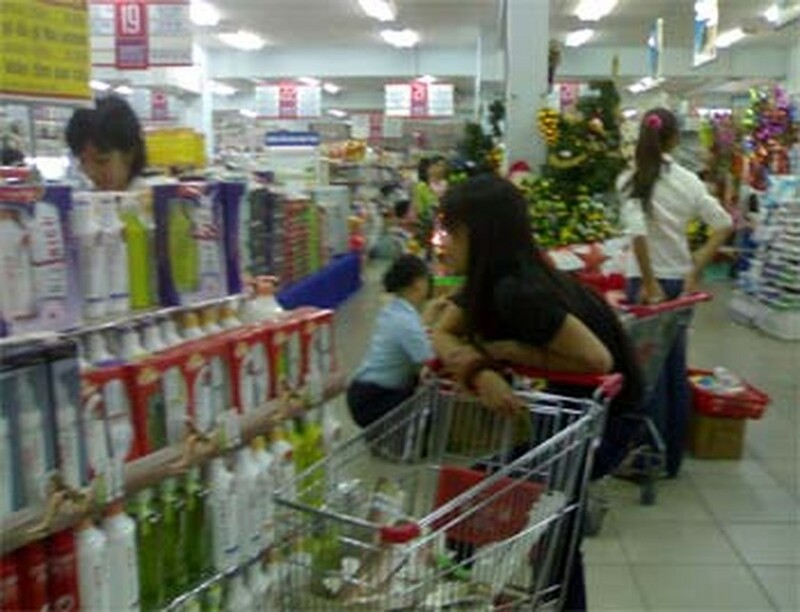 Mr. Nguyen Hoang Hai, who manages a sports store in the Metro shopping center, says the number of people shopping for Christmas decorations at Metro has been growing daily since the beginning of December. “The supermarket has stocked up on several different kinds of imported and locally made items with the most competitive prices,” adds Hai. 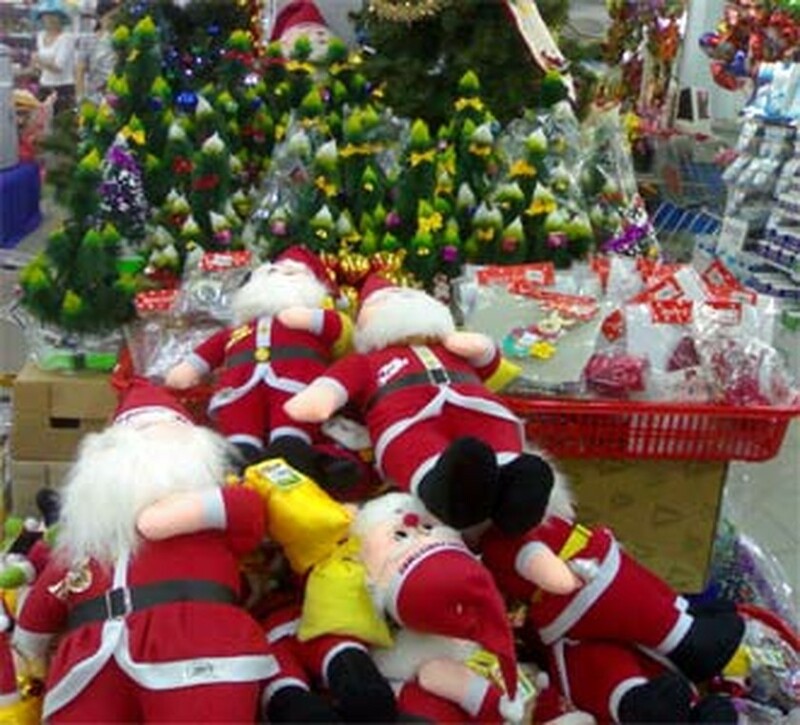 There are literally hundreds of kinds of decorations in the shops, everything from tree ornaments, bells and stars costing a few thousand dong to pine trees and figurines of Santa Claus and Mother Mary priced as high as three million dong. The biggest seller is a snow pine tree with a Santa Claus. There are many kinds of pine trees, ranging in height from 30 centimeters (VND15-20,000) to 4.5 meters (VND4-5 million). Most super markets are full of customers in the greeting season. The stores that sell Christmas decorations also decorate the trees for a little extra. 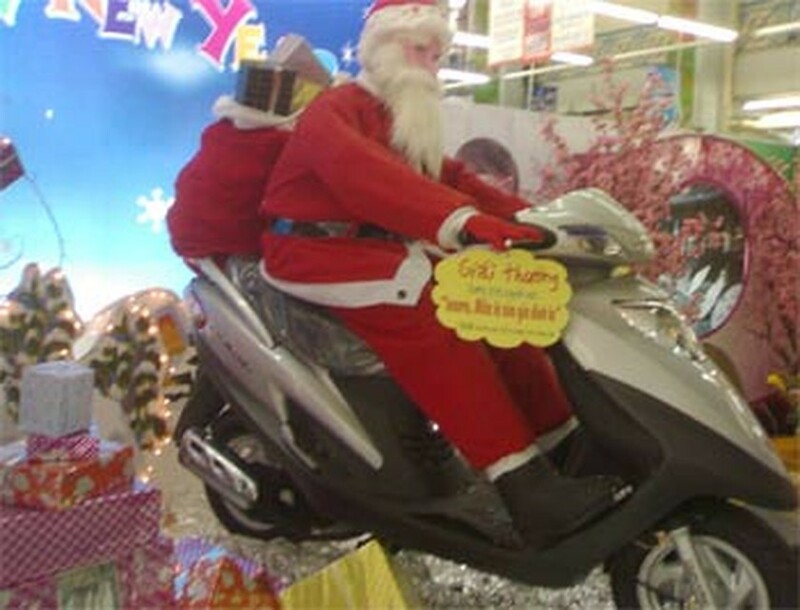 Another service gaining in popularity is Santa Claus in full regalia delivering children’s Christmas presents within the municipal area for VND30-50,000 a pop. Even though Christmas is not a traditional holiday for the Vietnamese people, the tendency to ape Western culture is making the season of Noel more and more a part of life in Ha Noi. The masses seem to find the seasonal atmosphere exhilarating, not just in the downtown area and the entertainment centers but in the home as well. “I studied abroad for many years and I love the Christmas atmosphere. Now I can enjoy it right here in Ha Noi,” says Ms. Thu Hang of Bac Linh Dam. “I went shopping for Christmas decorations with some Vietnamese friends, and bought some European pine tree ornaments at the supermarket,” says Jennifer, an American researching Vietnamese culture. Pine trees, large Santa Claus figures and colorful Christmas ornaments make for an exciting atmosphere in the big hotels, restaurants and entertainment centers. This year, the hotels have been planning for Christmas from an early date. One such venue is the Sofitel Metropole Hanoi. “We’ll be having a real Snow White Christmas in the Northern European custom,” says the hotel’s Ms. Thu Thuy. From the beginning of December, the hotels’ Gourmand Shop has been ready for Christmas with exotic food like Rougié goose liver, French turkey, Norwegian salmon and Cancale oysters along with hampers and baskets of Christmas goodies. Of course all the big-name restaurants will be serving Christmas dinner. Le Beaulieu will be putting on the traditional meal for US$80 per person, the Spice Garden will do it in a Vietnamese style and charge US$70, and Le Club Bar will host what it calls a “Christmas Festival” costing US$45. At the Melia, the Christmas program has been planned elaborately. The hotel’s Ms. Thu Hong says every restaurant in the Melia will have its own menu for Christmas, priced from US$16.80 way up to US$90 per diner. “Booking restaurants for Christmas parties is becoming popular in Hanoi, and not just by foreigners who are living or traveling in Vietnam. More and more they are well-off Vietnamese people,” says Ms. Thu Thuy from the Sofitel Metropole.